Could my post titles be any more boring? No, they could not. Back in the day before I became a harried time poor menopausal mother of two I had the energy and brain capacity to write witty and insightful prose. This blog aptly demonstrates what happens after 8 years of not enough sleep – obsessive sewing and boring sentence structure. But I digress. By Hand London Elisalex, puchased from Sew Squirrel. Its a red linen blend of some kind, a mystery as it comes from my “Husband’s Vietnam Business Trip” fabric stash. I think it has some synthetic in it as it still creases but does not take a high heat from the iron and also has a fair amount of stretch. I had to retrace my pattern as I have put on a few kilo’s (bummer, curse those hormones) and needed to go up a size. I always need to make a few changes to By Hand London patterns in the shoulder area. I did a small forward shoulder adjustment and a sloping shoulder plus took in the princess seam line closest to the armscye about 3/8″ (1 cm) tapering down to nothing by the first notch. I thought I adjusted the armhole curve properly but it digs in a little at the front as adjusting for the bust/gaping armhole made the whole front of the armscye too small/tight so clearly I didn’t adjust it enough/correctly. I also ended up with some annoying wrinkling/fabric buckling down the princess seam which you can see in the close up photo above. I think this is a combination of the stretch factor of the fabric, the dodgy armscye adjustment and the princess seam small bust adjustment. I don’t normally need this on this pattern but it needed one this time due to the stretch in the linen. However I didn’t adjust for the shorter length of that seam on the front side piece and eased it into the same length centre front bodice. 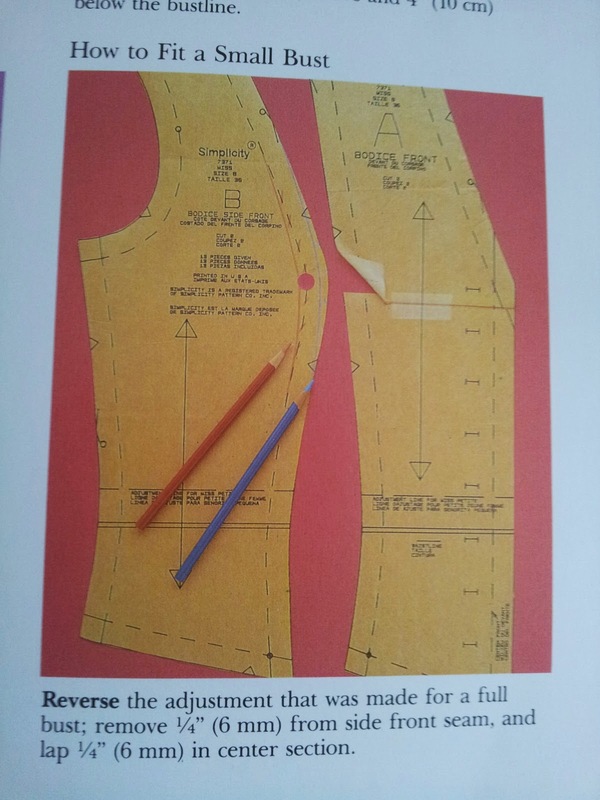 That really doesn’t make any sense without a picture, so here is what I mean, taken from The Perfect Fit: The Classic Guide to Altering Patterns (affiliate Amazon link). See how when you take off from the side front seam you need to reduce the length in the centre front? I only found this well after I’d finished this dress and had a “huzzah” lightbulb moment when I saw it. I think this is why I have the buckling here (plus the armscye issue, which I’ve mentioned so many times this post I guess you can tell its really annoying me). I now know better for next time. I also took a bit out of the centre back seam tapering down to a normal seam allowance at the waist to adjust for my narrow back. I added my trusty “self drafted” half circle skirt pattern, easy to make your own using the Circle Skirt App but I made my own the “hard way” (its really not that hard though) yonks ago. Instead of a lining I just used some self made bias strip facings to the neckline and collar. It is very important to staystitch the back neckline immediately after cutting to stop it from stretching out as it is basically on the bias. I did this this time and had no problem with gaping. I did a lapped zipper – its my favourite method if I am not using an invisible zip. 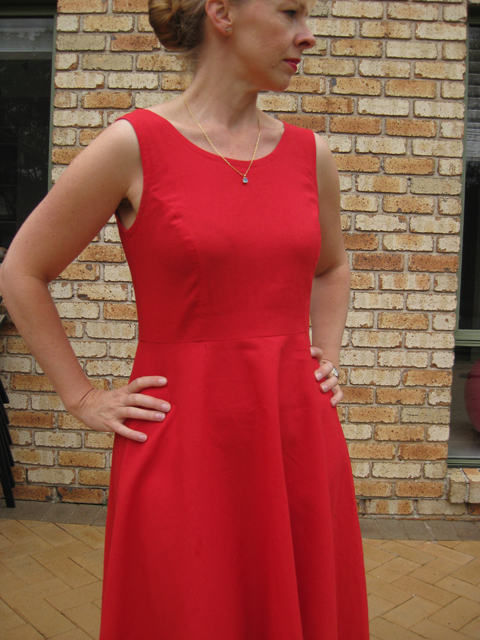 I used a catch stitch for the hem. Its my favourite hemming stitch, as it gives a lovely lace like effect on the wrong side but is invisible from the right side. Despite this being the third time I have made the Elisalex bodice I am still not nailing the fit quite right. Maybe next time. Its not anything anyone other than me and another seamstress/sewist/person who sews would notice though. I’m hoping. As the weather cools down I think I will make the long sleeved Elisalex as a final crack at the pattern before I put it away and move on to other things.